스톡홀름, 스웨덴의 롯지32 | 호스텔월드에서 예약하세요. The rest of balance must be paid up to 30 days before arrival date via credit card or invoice (contact us directly to get invoice issued). If balance is not paid in time your stay might be cancelled. Free cancellation and 100% refund up to 30 days before arrival. The following group types are not accepted by this hostel: Junior / Primary School, Stag/Hen/Bachelor Party If you have misrepresented the type of group you are booking for, your booking may be cancelled by the hostel." - We do not accept children under 10 years old. 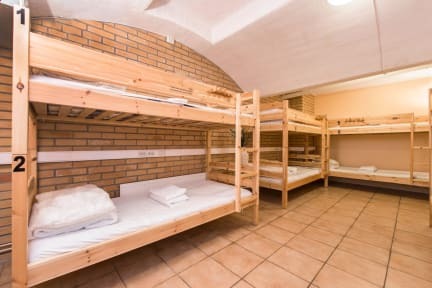 - All kinds of pets are accepted in private rooms and must be on the leash within hostel area. Lodge32 is a fresh youth hostel in white and blue tones with cave-like hallways just in 10 minutes walk to Stockholm city. Located right by the marina of Riddarfjärden, you have an amazing city'n'sea view just few minutes away! Park, restaurants, bars and shops are right on our street. From the hostel you can see the City Hall with all the sightseeing boats. Entrance and all rooms have access code locks, every dorm room has personal lockers. Located on -1 level, some of our rooms are windowless and provide good sleep without light disturbance. Along with booked bed our guests get free wifi, access to kitchen and city maps. Planning on a trip with friends or school? We provide special offers for groups with 10 people or more! Check in: anytime after 15.00. If you arrive past 18.00 you can check in on your Facebook page - just use check in option and state Lodge32 hostel as location. Check out: anytime before 11.00. We have an express checkout: just pack and go. Do not forget to drop used linen in the basket & check that your balance due is paid. Linen and Towels are costs 60 SEK per person. It's obligatory. You need to pay for it via link which we will provide you in 24 hours after your booking was made. * Children above 10 years are welcome. Please note that we are not suitable for any children below 10 years old. * Children below 18 years old may stay in hostel in presence of their parents or legal guardians. * No curfew: come and go as you please! Free cancellation at least 7 days before arrival date. If you cancel less than 7 days prior arrival - we will charge full amount as cancellation fee. If you do not show up for your stay without notification - we will charge full amount.